(Marietta, Ga., April 19, 2010) -- Lockheed Martin [NYSE: LMT] rolled out the first of a new fleet of HC-130J combat rescue tankers for the U.S. Air Force's Air Combat Command (ACC) during a ceremony here today. Maj. Gen. Thomas K. Andersen, director of requirements, Headquarters ACC, spoke at the ceremony. "Personnel recovery is one of the Air Force's core missions and vital to what we do in defense of America. The mission is demanding and we are grateful to those employees of Lockheed Martin assembled here that have given us a world-class aircraft ready for the demands of the mission," Andersen said. "The HC-130J will enable us to meet the expanding operational tasks that we face today - wartime operations in Operation Enduring Freedom and the Horn of Africa, and relief operations in the continental United States as well as in areas like Haiti and Chile. For that, ACC, the Air Force and the nation thank you." Lockheed Martin is contracted with the U.S. Air Force to build 21 C 130J Super Hercules to replace aging fleets of combat search and rescue HC-130s and special operations MC 130s. 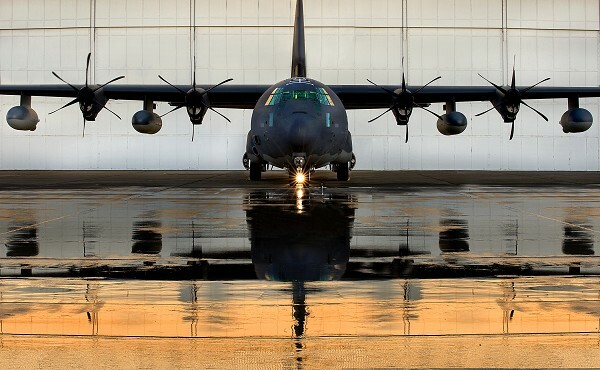 The U.S. Air Force is authorized to acquire up to 31 HC/MC 130Js (11 HCs and 20 MCs). "Yet again, we see the C-130 setting new standards for mission flexibility," said Ross Reynolds, Lockheed Martin vice president for C-130 programs. "This new configuration of the proven C-130J will give ACC unparalleled capability for combat search and rescue. As demand for the C-130J continues to grow around the world, we will see more ways this aircraft can meet the demands of any operator and mission." The new aircraft, which is based on a KC-130J tanker baseline, will have the Enhanced Service Life Wing, Enhanced Cargo Handling System, a Universal Aerial Refueling Receptacle Slipway Installation (boom refueling receptacle), an electro-optical/infrared sensor, a combat systems operator station on the flight deck, and provisions for the large aircraft infrared countermeasures system. In-line production of this configuration reduces cost and risk, and meets the required 2012 initial operational capability. With acknowledgements to ASD News. The C-130 can do just about anything, except hover and fly above Mach 0,5. It is also an excellent platform for Puff the Magic Dragon. The USAF fits a M102 105 mm howitzer to the AC-130. The SAAF can surely fit a 155 mm howitzer to the C-130.